Who are home modifications appropriate for? Home modifications are for anyone who currently has or could possibly have issues getting in/out and moving about in their home. Home modifications can be done to help after an injury. Home modifications can also be done in stages. 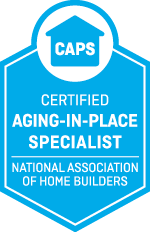 By doing home modifications in stages, this allows you to be able to have the modifications that you currently need, but is a proactive take on aging to ensure you can stay in your home. Will accessible modification devalue my home for future sale? Accessible modifications will not devalue your home! If you have a stairlift, ceiling lift, ramp, etc installed it can easily be removed prior to the selling of your home. The installation and removal is done by a professional to ensure your protection. Why do I need a stairlift? A stairlift is a great alternative to having to completely modify your home. For example, if the master bedroom is on the second level, it is often unthinkable to find space to modify a room on the main level of the house for the new master bedroom and bathroom. By adding a stairlift, this will allow you to easily get up and down your stairs, eliminating the need to relocate the master bedroom. Why do I need a bathroom modification? Bathroom modifications are a great way to ensure your safety! Approximately 80% of falls happen in the bathroom. Bathroom modifications can range from something as simple as adding grab bars around the toilet and in the shower, or up to rearranging the bathroom and adding an easy access shower/tub. Check out our bathroom modification for more ideas. What are the benefits of making my home accessible? Being proactive is much better than being reactive! Being proactive is knowing that you want to remain in your home, but could possibly have some issues moving within the home and getting in and out of your home. By making plans to do accessible home modifications, this can allow you to remain in your home. Being reactive is having a fall inside your home and injuring your self and needing home modifications immediately because without them you won’t be able to return home. Home modifications for accessibility are for all ages! These modifications can help to make life easier. Why do I need a ramp? A ramp is a great way to remain in your home without the worry of stairs. There are many different kinds of ramps that we offer and install that are all affordable, durable, and aesthetically pleasing. Check out our ramps page under the products tab in the menu. How difficult will home modifications be? We have a great staff of trained professionals that will be able to provide the modifications that you need. We do all that we can to make this process as easy as possible. We understand that each person has different needs, and we strive to do all we can to meet each specific need. Please call us for more information on how we can assist in your home modifications. Can a stair lift go around a corner? YES! We have a variety of stair lifts that can go around corners, on a curved stair case, or a straight stair case. Does the VA cover stair lift cost and installation? The VA covers stair lifts in the SHA or SAH grant. Why is a stair lift installation so expensive? For safety and warranty reasons, stair lifts must be installed precisely as prescribed by the manufacturer. Failure to do so could endanger you or a loved one. Also, since each home is constructed differently, accommodations must be made to ensure the stair lift is installed in a way that will not only look nice, but also be safe for you. Our team of professionally trained technicians and installers are there to ensure your product is installed properly, safely and will continue to work for you for the long-term. Can I sell a stair lift once we are done with it? Some manufacturers or installers offer programs that will buy back your used stair lift. Some of them can even remove the stair lift from your home and do any repairs or cleaning before it is sold. “The national average to install an elevator or chairlift is $4,394, with most homeowners spending between $2,620 and $6,247. However, total cost can increase significantly depending on the location and type of home. A large hydraulic elevator hidden behind a wall can cost as much as $75,000.” ~HomeAdvisor, How Much Does An Elevator Or Stair Lift Cost To Install? A platform lift is generally more affordable than a home elevator. For instance, a vertical platform lift price could be between $4,000 and $10,000 (depending on brand, model and features), plus installation costs. In contrast, a home elevator will almost always require remodeling of some kind before even buying the elevator and having it installed. That can cost $25,000 and up, depending on model and remodeling needed. So, a vertical platform list is clearly a more affordable choice.